WishYoo, a leading platform that replicates the experience of traditional greeting cards, announced that it has been granted the U.S. Patent No. US10235131B2, for a communally constructed electronic card. 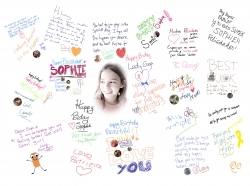 Now everyone can participate in the same WishYoo card using their own hand-writing, audio messages, and pictures. San Mateo, CA, April 08, 2019 --(PR.com)-- WishYoo.com, a leading platform that replicates the experience of traditional greeting cards, announced that it has been granted the U.S. Patent No. US10235131B2, for a communally constructed electronic card. The ability to engage desktop and mobile users to participate in common cards, using their own hand-writing, audio messages, and pictures, is a core differentiation of Wishyoo’s technology. Retailers worldwide sell billions of paper cards every year, and data shows that most times these cards end up in the trash for a variety of reasons. The Wishyoo platform allows consumers to save money and time, while easily preserving memories and the forests of our planet. Additionally, WishYoo cards allow individuals and companies to gather contributions towards communal gifts, which can take the form of regular merchandise, charitable donations or gift cards. Anyone invited to sign a WishYoo Card can do it for free, without having to register on the platform or provide an email. Through its B2B portal, hospitals and corporations, using pre-loaded and tailored content that expedites the card creation process. These branded cards can be done in as little as 5 seconds and are a great tool to engage the social networks of employees and patients alike. While other e-cards are sent from one person to another, WishYoo can gather personal handwritten messages and pictures from thousands of people all over the world, in the same space. All this content can be downloaded in high definition, or easily embedded in other websites. The dedications on a WishYoo can be used to personalized gifts and merchandise like t-shirts, coffee mugs, towels and even cakes. Wishyoo’s versatile architecture also allows users and brands to donate birthday or anniversary cards by creating personal fundraising campaigns to support a favorite charity or cause. Among other high-profile events, WishYoo was the technology chosen to celebrate the 75th anniversary of the Golden Globes, and the 70th anniversary of the Cannes Film Festival. More than 200 A-list Hollywood celebrities have used the WishYoo platform to convey their support to these important events. More Trees, Inc (former Web Resources, llc) created the WishYoo platform with the dual goal of saving 5 million trees every year and becoming a true global product that responds to the demands of the new millennial generations. Click here to view the list of recent Press Releases from More Trees, Inc.